MANILA – Flooding is not a significant barrier for those who have a strong determination to tie the knot as a married couple. At least, this is true for Filipino couples Hernelie Ruazol Ramoncito Campo and Campo. Ramoncito and Hernelie reportedly kissing tenderly after wedding vows in a Catholic church in Manila. 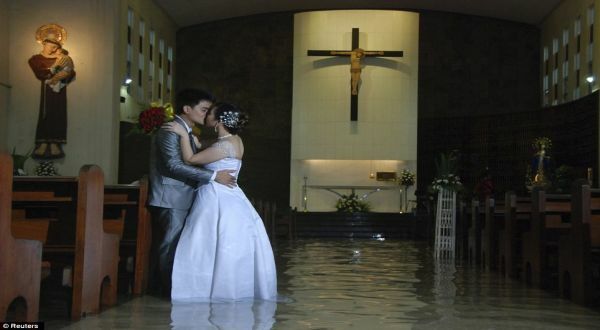 The couple formalized their marriage amid the atmosphere of flooding that besiege Manila and nine other provinces. So reported the Daily Mail, Monday (13/08/2012). This happy couple seems to not want to miss a moment of their wedding which was held in the middle of a flood is to take pictures in some streets. Citizens residing in the neighborhood had a moment to forget their pain and share thrilled to see the wedding. Flooding caused by a tropical storm in the Philippines is said to have killed approximately 66 people, while others joined approximately 2.68 million affected by the floods. Approximately 440 thousand people reportedly fled to evacuation centers that have been provided by the government. Philippine officials said they will begin to mobilize thousands of people to clean up Manila and homes filled with mud and garbage piles. ~ by ickerz on 28 August 2012.